The maps and tables below show 2019 international container shipping rates & costs for moves originating in the US, UK, Canada and Australia. You can jump to the relevant section using the following links: US, UK, Canada, Australia, 20ft vs 40ft Containers, LCL vs FCL, Land Freight, Sea Freight, Air Freight, Loading & Delivery, Other Costs. Note on data: The prices listed above are a sample of sea based port-to-port cargo rates and costs from WorldFreightRates.com based on trips between the ports listed only! They are based on moves involving $50,000 worth of household goods and were accurate as of early 2019. However, given the nature of the international shipping industry you’ll need to get a quote for more accurate prices. Moreover, the prices listed above do not include the full cost of door-to-door moves. Given that each move is different, the only way to get an accurate cost estimate for your move is to get a free moving quote. When comparing prices for international container shipping and moving, it’s important you understand what you need and how that affects the price you’ll end up paying. The first thing to understand is the difference between an international mover and a freight forwarder also known as non-vessel operating common carrier (NVOCC). Basically, a mover can arrange your full move for you including pick-up, delivery and shipping. Freight forwarders and NVOCC’s can provide very similar services as an international mover, but they tend work more with commercial container shipments for businesses, rather than one off moves. That said, if you are shipping a full container load (see below) you may also want to look into freight forwarders. There are two standard intermodal shipping container sizes in use throughout the world, the 20ft and 40ft (see above). We’ve provided rates for both sizes above to give you and idea about the relatives costs of each. Other common variations include the 40ft high-cube container and the 45ft high-cube container, along with refrigerated containers and tankers for liquid. Suitable for: 1-2 bedroom moves or a car with only a few boxes. 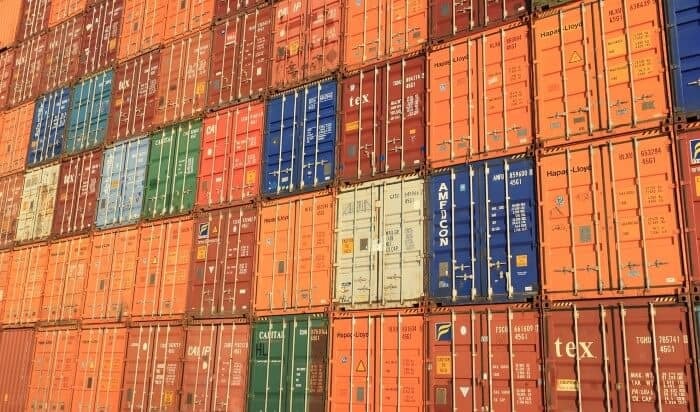 Note: While a 40ft shipping container can typical hold about twice as much (in volume terms) as a 20ft one, it can actually carry less total cargo weight due to the weight of the container itself. Thus, if you’re looking to ship a car and a large household you may need more than 1 container. Another, set of term you may come across are LCL and FCL. Less Container Load (LCL): This refers to moves or shipments that require less than a full container (either 20ft or 40ft). However, most companies will impose a minimum shipment volume, sometimes as low as 35.3 ft³ (1 m³). This can be the most cost effective option for very small moves, but it can often work out cheaper to just pay for a full container. Full Container Load (FCL): This refers to moves or shipments where you pay for an entire shipping container. This means all your goods as shipped together as one and means no one else’s goods are shipping in your container. Shipping companies generally prefer when people pay for FCL as it makes the logistics at both ends much simpler. There are two types of land transportation used to ship containers: trucks and trains (via rail). Virtually all moves will involve a truck. Domestic and international moves within the same continent will likely be done entirely by truck and usually by one company. Whereas moves overseas can result in coordination between trucking companies. Any moving company you choose should make it clear how these costs break down and who will be responsible for what during the moving process. Speed: Trucks can generally drive as quickly as road conditions will allow. Costs: Moderate, but are unavoidable. Examples moves: Domestic moves within the same city or country, United States to Canada or Mexico, Canada to the United States, United Kingdom to mainland Europe or Ireland (via ferry), and moves between countries in Europe. 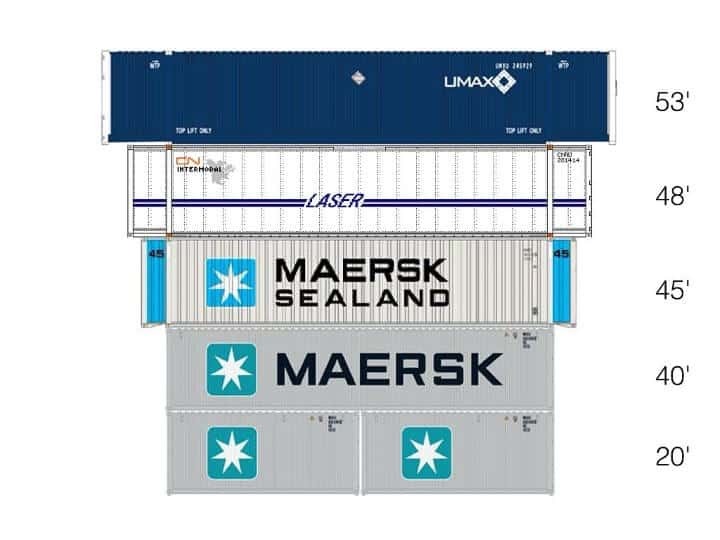 The use of rail transportation to move shipping containers is also very common and can be much more cost effective than shipping via truck for long distance moves within a continent. Speed: Depends on origin and destination, but usually slower than trucks. Cost: For some journeys can cost less than using a truck. Examples moves: Moves between the East and West coasts of North America, long distance moves between Eastern and Western Europe and some domestic moves within Australia. Sea freight or shipping via container ship is by far the cheapest way to move goods internationally but also the slowest. However, if you’re moving goods between continents, you normally have little choice but to send them via container ship. Speed: Slow, depending on routes can take from a few days to several weeks. Example moves: United States to Australia, United Kingdom to the United States, South Africa to Canada, New Zealand to Australia. Air freight is only rarely used in full household container moves due to the extremely high cost. Shipping via air can easily cost 10X as much as shipping via sea. Therefore, if you have some items you want to have with you as soon as you arrive in your new country, you should ship them via plane, but it’s much more cost effective to send the bulk of your goods via boat. Cost: Very high for large moves, but reasonable if only shipping a few boxes. Example moves: Any two cities that have airports. This is the most basic option, and is what the rates at the top of the page are based on. Basically, with port to port shipping you are responsible for getting your goods to the origin port, the shipping company ships them to the destination port and then you’re responsible for getting them to your new house. This is where the shipping company drops off a shipping container at your house and you fill it yourself. You may be able to use local movers and packers who work separately from the shipping company to help out. Similarly this can be an option at the other end of your move, where the shipping company just drops the container at your new house and you are responsible for unloading it. By far the most common choice for people moving abroad is a complete door to door moving service. Depending on the options you choose your mover will arrange to have the container delivered to your house, packed, moved to port, shipped, moved to your new house and then unpacked. If you don’t have much experience moving internationally and/or are shipping an LCL load this is the recommended option. We listed international container shipping rates above, but these are by no means the only costs involved in any international move. When moving between countries you could face some of these costs as well. Insurance: If you’re planing to ship your entire home overseas (or even just around the corner), it’s very important everything is insured. So make sure your shipping company has adequate maritime insurance. This will give you peace of mind that should anything get damaged or broken during your move, you’re not out of pocket. Packing Costs: Many, if not all, international moving companies will make it a requirement that they pack your goods for you. While it may seem this is just way to add on an extra cost, there are good reasons for it. First, it helps prevent fraudulent insurance claims, which drives up the cost for everyone. Second, it can be requirement for taxes and duty (see below). Taxes/Duty/Customs Charges: Before shipping your home overseas, it’s highly recommended that you do some research into how the country you’re moving to treats international moves. Some will impose taxes and/or duties on the value of the goods entering the country. It’s good to find out how much these are likely to be, before you move so you’re not faced with any nasty surprises. Storage: Also, if you’re not planning to move abroad permanently it can be worth checking how much storage in your home country costs. This can sometimes work out cheaper than shipping goods overseas and then back again, especially if your home country also imposes taxes and duties on goods being shipped. No reason to pay twice for the same things. With the cost of oil plummeting and a glut of container ships on the market, now is a great time to get a good deal on international container shipping. However, basic rules of economics still apply and you’ll pay more for long distance moves and/or moves that involve less trafficked shipping routes. In all cases the easiest way to ensure you get the best deal is to get a free moving quote. Your move is unique and so there’s really no way to give you a fully accurate estimate without getting more details from you about your move. Fortunately, we’ve made it extremely simple. Just fill in the form at the top of this page with a few basic details, and we’ll get started trying to find you the best rate possible.